Now that Timothy Bonga has been recycled as MP for Nawaeb, perhaps he can apologise to me and compensate me for the beating that I received at his hands last year before the elections. The good people of Nawaeb and the rest of Papua New Guinea should know that for no apparent reason, outgoing Eda Ranu executive chairman Mr Bonga harassed, insulted, and then assaulted me at the Lamana Gold Club on Friday evening, May 4, 2007. The incident happened as I was about to leave Lamana after a few “Happy Hour” drinks with workmates. Mr Bonga confronted me as I was leaving – out of the blues - and accused me of working together with Lae MP and New Generation Party leader Bart Philemon to bring him down. He made reference to the recent newspaper reports about his payout from Eda Ranu. I denied this, saying that I was no longer working as a fulltime journalist, and walked out to catch a taxi, but Mr Bonga followed me outside where he punched me, pushed me to the ground, and then proceeded to kick me in full view of security guards. I suffered a black eye, a sore face and a painful back. This was a criminal matter, which I wanted to pursue further with police, but decided not to, lest his election chances be jeopardised. In true Papua New Guinea style, it is only fitting that Mr Bonga compensate me, my family, and my friends, given that he has already received his big pay cheque from Eda Ranu and is now Nawaeb MP. The PNG Coffee Festival web address is below. If you have time take a look. Morobe province today remains one of the most-populated provinces of Papua New Guinea with nine districts. Apart from Lae, an urban district, the other eight districts – Kabwum, Tewai/Siassi, Finschhafen, Nawaeb, Huon, Markham, Bulolo and Menyamya - are in remote, far-flung rural outposts. Many of the thousands of children in Morobe are inadequately educated, or receive no education at all. Picture caption: A proud Morobe Governor Luther Wenge (front), Education Advisor Murika Bihoro (left) and Deputy Administrator Geoving Bilong with UPNG graduates last.Nationalpic by LUCY KAPI. Hundreds do not complete primary education, which means that, sadly, they ultimately cannot go on to university. The individual and societal consequences of this chronic national crisis are profound. Children are consigned to poverty and isolation—just like their parents—never knowing what the light of learning could mean in their lives. At the same time, the government struggles to compete in a rapidly-evolving, global information economy, hobbled by a vast and increasingly urban underclass that cannot support itself, much less contribute to the commonweal, because it lacks the tools to do so. It is time to rethink this equation. Given the resources that poor countries like Papua New Guinea can reasonably allocate to education—sometimes less than US$20 (K60) per year per pupil, compared to the approximately US$7500 (K22, 500) per pupil spent annually in the U.S.—even a doubled or redoubled national commitment to traditional education, augmented by external and private funding, would not get the job done. Moreover, experience strongly suggests that an incremental increase of ‘more of the same’—building schools, hiring teachers, buying books and equipment—is a laudable but insufficient response to the problem of bringing true learning possibilities to the vast numbers of children in the developing world. Standing still is a reliable recipe for going backward. Any nation's most precious natural resource is its children. Papua New Guinea can leverage this resource by tapping into the children's innate capacities to learn, share, and create on their own. In 2003, visionary Morobe Governor Luther Wenge, Provincial Administrator Manasupe Zurenuoc and Provincial Education Advisor Murika Bihoro decided that Morobe must not be left behind in this rapidly-globalising world. They made a landmark decision to sponsor full tuition fees for Morobe students attending major tertiary institutions like the University of PNG, University of Technology, University of Goroka, Pacific Adventist University and Don Bosco Technological Institute. Thus was launched the Gerson/Solulu Scholarship, named after two of the province’s most-profound educationists, Michael Gerson and Joe Solulu. Since the scholarship scheme began in 2003, the Morobe government has spent over K9.5 million, and produced over 1,000 graduates, who do not necessarily have to work for the province. It was a proud Mr Wenge, Mr Zurenuoc (now Secretary for Provincial Affairs) and Mr Bihoro who witnessed the first lot of 34 Morobe students graduate from UPNG last Friday. “Most of the students who get picked to come to university are children of people in rural areas, whose economic and financial base is very low,” a proud Mr Wenge told The National. “God, in his wisdom, has given them intellectual abilities, and also, to be someone eventually, and will serve the province and the nation in whatever discipline they are trained in. “Unfortunately, our rural people don’t have the financial capacity to sponsor their kids to these schools. “And we, the provincial government, felt that we must help. “It doesn’t matter whether they are poor kids or not, but we must help by providing money to get them trained. “We are proud, and we share the sentiments of the parents, whose kids are graduating today. “Morobe is entitled to be an intellectual community. “We, as the provincial government, must seriously invest in our human resources for the education of our children. “It’s becoming an intellectual world. “We must do something to meet the challenges of the world. “We think that education is the way. “Since we began in 2003, we have spent K9.5 million. “We have already produced, so far, 900 graduates, and with this year’s graduates, the number is now more than 1,000. “We are paying 100% parental component. “Say, for instance, if the parental component is K5, 000, we pay the full K5, 000. “The mission we have set to achieve our intellectuals, I think we have achieved that. 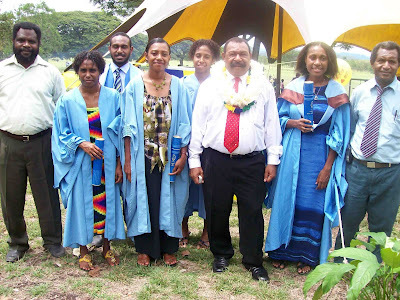 Mr Bihoro said: “This is the first lot of graduates of UPNG. “It (scholarship scheme) started because the universities started charging high fees. “We saw that there were a lot of Morobe students coming to university from Bugandi, Bumayong and Wawin (high schools) at that. “A lot of children are from very-remote places in Morobe. “Parents definitely cannot afford those high fees. “Even to this day, we recognise that parents cannot afford those high fees. “So Governor Wenge saw the need and he started discussions with Administrator Manasupe Zurenuoc and myself. “We saw that we could help somewhere along the provincial government budget. “Our political leaders supported it in the Tutumang with the initial allocation of K2 million. “For the students that are graduating today, I can see that the scheme is truly helping Morobe students. “Students from all nine districts are represented. “Through this scheme, we are able to know how many of our children complete secondary school and go on to university. “We also know which particular village, Local Level Government and district they are coming from. “Now, we are going to work on the middle part,” Mr Bihoro said. Mr Wenge injected:” We will be sponsoring kids to technical schools. “We will be building more technical skills, value education between intellectual and technical students, producing mechanics, carpenters, etc. “We are fortunate to have so many companies investing in the city of Lae and creating job opportunities. The popular Gogodala Canoe Festival will be held from April 23-24 in remote Balimo town of Western province. It will be a celebration of the spectacular canoes, arts and crafts and traditions of the Gogodala people. The festival was incepted as the Balimo District Agricultural and Cultural Show five years ago and has grown to be bigger and better each year. Picture caption: One of the spectacular war canoes of the Gogodala people. Picture courtesy of National Cultural Commission. The Middle Fly district administration, on behalf of the Western province administration, organises the event every year with financial support from the National Cultural Commission and Rimbunan Hijau. “In Middle Fly district, and particularly in the Gogodala area, canoes are part of the people’s lives,” said NCC senior festival officer David Taim. “Their culture is associated with the canoe and many depend entirely on canoes for their daily survival. “Apart from that, the Gogodala are most-prolific artists. “Many of their creative imagination art works surround animal figures associated with clans. “And each clan has its own war canoes which are a massive 40 metres or more in length. “These were the war canoes used in the olden days for warfare between tribes. Papua New Guinea today remains one of the most culturally-diverse and unexplored nations on the planet. Scattered inland are many small villages, each group practicing their own native tongue and traditions, eking out a living from the surrounding land. Travel to the remote village of Iruupi, Western province, and you will have to be prepared to do lots of walking. To travel to Iruupi, you have to fly in to Daru Island, and then be prepared to make a crossing back to the mainland on a fiberglass dinghy. Despite the short crossing, with a heavily-laden boat, it can be quite treacherous at times when winds make for heavy seas. Once across the strait, the dinghy sets a course adjacent to the mainland shore along the beach and an extensive coastal coconut grove comes into view, the subject of a fierce land dispute between Badu-suki tribe and others for centuries. The dinghy gives the mouth of the Fly River a wide berth, paying respect to its strong currents before again trekking close to the shore, and to the mouth of the Kura River about 30 minutes later. From here the 5 to 8km journey along the Kura is much slower, low tides necessitating care is exercised in negotiating fallen trees, sand banks, the occasional goanna and keeping an ever-present watch for a disgruntled crocodile. Finally, it reaches the landing point Lani, the mangroves and palms along the muddy riverbanks giving way to grassland and a few of the ubiquitous gardens that would later become evident. From Lani is a narrow marsh road to Iruupi village. A short walk by village standards, some 5-6km, weaves through overgrown grasses, bamboo forests, swamps, marshes, and surprisingly, many eucalypts. For the people of the village, every tree, every scratch in the dirt and ever tract of water is inextricably linked to some significant story or event. Traversing a waist-deep small swamp reveals the first sighting of traditional Iruupi houses – bamboo constructions on the outskirts of the village, supported by poles with an under storey platform where inhabitants can gather away from the heat of the day, each distinctively different in those erected in other provinces through Papua New Guinea. Upstairs are verandahs, bedrooms and a traditional kitchen – the timber strutted floors covered with woven mats to maximise comfort (in Daru, many of the more ‘westernised’ pre-fabricated houses still have a traditional bamboo kitchen erected at the rear). In the main village, houses are erected around the periphery, enabling the central areas to be used as common meeting, play and performance areas. Villagers do all the hunting, cooking, washing and other chores, leaving visitors idle to simply enjoy the surroundings. Villagers tend to their gardens each day, rich with taro, bananas, greens, melons, pineapple and other fruits planted for harvesting in the dry season. Skilled hunters meant there is a ready supply of deer, wild pig, wallaby and cassowaries. These will be brought back to the village strung over bamboo poles, while hunting implements are carried in a free hand. Kupilute is a large lagoon, believed to be sourced by a well of unknown depth in the middle, and linked to creation stories of the Bewani people. It is believed the well forms the basis of a tunnel that goes all the way to the Australian mainland. When diving for fish, prawns or lobster in the lagoon, locals skirt the edges, fearful of an encounter with Sapi-dade, a dreaming spirit. Paying homage to the spirits in the appropriate way ensures there is a plentiful supply of seafood. Yet another walk to a place called Imbade reveals a broad and pristine river that must be crossed in a dugout canoe or outrigger to reach the village of Masingara, home of warring tribes and family of the Badu-suki tribe of Iruupi village, some 2-3 hours away. Most nights are filled with exotic and traditional dance in preparation for an upcoming event. Pointing the torch to the lagoon beyond the washhouse reveals the red eyes of a crocodile, each night keeping watch. For the people of the village, a simple taro or coconut is treated as a prize, yet readily shared among others, to ensure no one goes without. Each and every person is proud of and well-schooled in their culture and identity, benefiting from an almost unspoiled existence with limited contact with the white people, in contrast to some of the major centres where the negative effects of colonisation and decolonisation, subsequent to Independence, can be observed. In leaving the village for the long walk to Lani, through a procession of well-wishers and tearful souls, one can enjoy the breathtaking scenery. At Lani, it is last goodbyes, the sun poking through and the promise of a return in the future to renew special bonds, as the dinghy heads for the open sea. My good friend and writer TIRI KUIMBAKUL now has his own Blog at this address http://tirikuimbakul.blogspot.com/. Have a look at this Blog to see what books he has on offer as well as what else he is writing about. Daru is a place that has to be seen to be believed. Wherever there is a large tidal range, it is usual to find at low tide mud flats, rock pools and a general air of desolation. True, at Daru, there are mud flats and rock pools. But desolation is not the word for the waterfront of the capital of Western province. Every day, outboard motor-powered dinghies and sailing canoes come in from outlying villages. The passengers are coming to town for a variety of reasons: those from nearby villages may be coming to work – an idyllic way to travel, provided there is a favorable breeze and no rain squalls; others may be bringing their produce to market. Not that they are likely to do a booming trade – but it gives them a good chance to chinwag with their friends while waiting for a sale. And then there is the entrepreurial class: fishermen with barramundi catches, prawns, lobsters, sea cucumber, or live dugongs and turtles for cutting up and sale at the water’s edge; farmers with pigs, again for sale on the beach. Several canoes are anchored semi-permanently on the mudflats, floating homes at high tide. There are no elaborate cabins on them, just a sail thrown tent fashion over the boom. More permanent boat homes have sago palm roofs. No one worries about privacy on the mud flats of Daru. The town still has that frontier feeling from the colonial days still about, as I found out last week. It is a place of fishermen, traders, crocodile shooters, conmen, smugglers, and so on. Australia, specifically the Torres Strait islands, is closer to Daru than Port Moresby and the drug trade proliferates. Things are pretty slow here and the people seem to be too busy chewing buai, smoking, chatting and drinking away than to cut the tall grass all over town. That dismal image, however, may change soon with the development of the Daru Port. Air Niugini is also looking at restoring Dash 8 services to Daru to compete with Airlines PNG. Indeed, Daru is on the verge of greater things. In life, my wife, Hula, often talked about the natural Eden-like beauty of her remote Iruupi village in the Western province, just across the Torres Strait from Australia. We had talked many times about visiting Iruupi during our 10 years together, however, this was not to be. My dear wife told me many-a-time of the natural beauty of Iruupi – a virtual Garden of Eden - with its waterways, barramundi, prawns, deer, wild pig, wallaby, cassowaries, taro, bananas, greens, melons, pineapple and other fruits. She implored me to go and write a feature article of the place and take pictures of its breathtaking scenery. Sadly, this would never be, as my beloved wife passed away so suddenly and tragically at Daru hospital on Easter Sunday, March 23, so far away from me and our four young children Malum Jr (7), Gedi (6), Moasing (3), and baby Keith (9 months) in Port Moresby. Hula had been suffering from suspected post-natal complications following the birth of Keith last June. She visited Iruupi to be with family, however, in the process, fell ill and was admitted to Daru hospital on Easter Saturday, but died the next day, leaving behind a broken-hearted husband and four young children. Memories of another day came swirling in my mind as I struggled to come to terms with the reality that Hula, who was only 31 years of age, would never grow old with me and watch our four wonderful young children grow up. My thoughts went back to 1998 in Lae, when I met the most-beautiful woman I had ever seen, and fell head-over-heels in love with her. Hula, who was then living in Australia with her uncle and auntie, was in Lae for holiday when I first courted her and would not take ‘no’ for an answer. We started dating, and our love blossomed, to the point that she left for Australia with the promise that she would be back to live with me as my wife. Towards the end of 1998, I secured a job with the Coffee Industry Corporation in Goroka, and Hula joined me in early 1999. 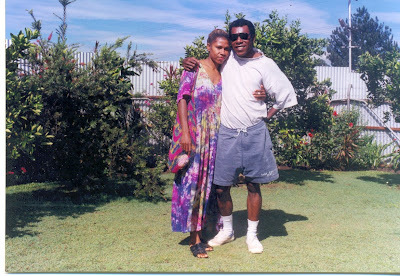 We had a big three-bedroom house at the Rotary Park in West Goroka, with a big backyard and garden, and life was a dream to a young couple like us. We’d roll on the grass like children, grow our own vegetables, take long walks along the streets of Goroka, go to market, have long lunches at the Bird of Paradise Hotel followed by a dip in the pool, lie in the park at the airport watching planes land, and catch a PMV or take a long drive to Lae as I pointed out places of interest to Hula. Yes, indeed, life was a wonderful, carefree dream for us star-crossed lovers. We were active members of the St John’s Lutheran Church at West Goroka, with Hula being a member of the church choir, and I have so many fond memories of watching her practice and then walking back home with our hands around each other on those cold Goroka nights. Hula’s radiant personality and friendliness won us so many friends among the people of Goroka. In early 2000, she became pregnant, and on Saturday, November 4, 2000, I held her at the Goroka Base Hospital and cried after she gave birth to our first son Malum Jr.
We regaled in the joy of becoming parents and enjoyed every minute of Jr growing up at our new home at North Goroka. Our second son, Gedi, was also born in Goroka on February 13, 2002. The laid-back lifestyle of Goroka, however, was to end later in 2002 when the CIC underwent a major retrenchment exercise in which about 75% of its staff, including me, was laid off. We moved to the big smoke of Port Moresby, and although life was good, we never quite got to enjoy the privacy and happiness we once had in Goroka. Hula, being the good wife that she was, stuck with me through thick and thin. We were blessed with a third child, a girl named Moasing after my mother, in August 2004 and she brought so much joy to our hearts. Keith came along last June to complete our hat-trick of boys and complete our basketball team. At the end of last year, when my three-year contract was up, I decided – after consultation with Hula – to move on to The National where we both believed I could contribute more to the country. To mark the occasion, we family celebrated by booking a room at the Holiday Inn, where we ate and drank as much as we wanted to. At the beginning of this year, Hula started complaining of burning sensations in her body, which doctors said was heartburn brought about by child birth. She was put on medication, however, the sensations continued, by which time Hula insisted that she go home to her village in Iruupi. I tried to stop her, as she was due for an internal scan and x-ray, however, she would not be moved and flew to Daru, with a relative of hers as babysitter to take care of our children in Port Moresby. I would never see her alive again. On Easter Monday, my daughter Moasing and I traveled to Daru with Hula’s coffin, helped to dress her up, I kissed her for the last time, and it was homeward bound on the dinghy hearse for Iruupi. I held Moasing and cried all the way from Daru Island to Iruupi on the mainland, as all those charming places Hula had told me so many times about, came into view. We buried her the next morning, next to her beloved father, amidst a throng of mourners. Before I very reluctantly let her off to Daru, Hula held me, and told me: “Darling, I love you very much. I know Hula is in God’s arms, away from all the evil of this earth, and will do everything I can to honour her memory. It is my sad duty to inform all you readers of this Blog of the untimely death of my beloved wife, Hula Debe Nalu, in Daru on Easter Sunday, March 23, 2008. Hula had been suffering from suspected post-natal complications following the birth of our fourth child, Keith, last June. She visited Daru to be with family, however, in the process feel ill and was admitted to Daru hospital on Easter Saturday, but died the next day, leaving behind me and four broken-hearted young children. She was laid to rest at her Irupi village on Tuesday, March 25. I was away for a week because of this totally-unexpected tragedy which has befell me, and returned to Port Moresby on Saturday, March 29. Please think of me and my four young children, as well as our beloved wife and mother, in your prayers. Hula is pictured above giving a seesaw to our one and only daughter Moasing.